There’s more the EverSewn Hero sewing machine has to offer than most other traditional ones. A sewing machine with three different perspectives; computerized sewing machine, computerized embroidery machine, and a sewing and embroidery machine. In the aspect of design, ease of use and the user experience, the EverSewn Hero computerized sewing machine is a round peg in a round hole. Equipped with all the sophisticated features that appeal to the younger generation. Nonetheless, it is still traditional enough for the oldies. A visit to sewing studios in the United States, you will see the level of acceptance and reliability the EverSewn brand commands. The popularity of EverSewn Hero among celebrity bloggers is not just enough as a reason, there is more. Being a computerized embroidery machine, professionals will enjoy enough space the machine offers. There’s a close comparison between the design of this sewing machine and the quality of stitches it produced. More style and appeal goes into the EverSewn Hero than it is needed for any sewing machine, I have seen. 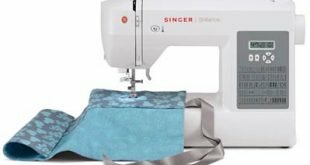 A sewing machine in a class of its owns without sacrificing the quality of stitches. Therefore, you don’t need to choose EverSewn Hero because of its popularity. Just give a thought to its build and be convinced. 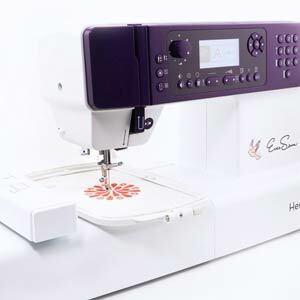 Rarely will you find anything you’ll need for sewing and embroidery absent on EverSewn Hero. One sewing and embroidery machine with features that leads, while you follow the lead. The volume of the 400 built-in stitches can get you confused as a newbie. In other words, you may be dazed as to which one to work with. It doesn’t end here; 40 embroidery designs should be enough to get your creative edge on the high. There’s even room for more, just connect via the USB port and you are right on track. Quite much of a speed for anyone to handle at 850 stitches per minute. Don’t worry though the stitching speed can be controlled by a slide speed control. Just the right speed for intermediate and expert users to get started. For your embroidery works, it’s time to consider large-scale projects with the 110mm by 170mm embroidery workspace. 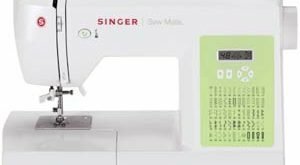 As a computerized sewing machine, you should expect some automated features such as needle threader, bobbin thread monitoring, and LCD screen. Your expectation is totally met especially the bright and robust LCD screen that displays in normal, memory and embroidery mode. 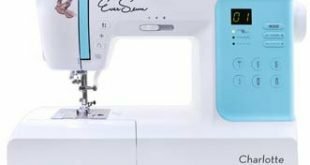 While other EverSewn sewing machine, products have between 1 and 6 buttonhole styles, the EverSewn Hero took it farther with 10. For your needle, there’s an up and down button to control the movement. And for this sewing machine, a start and stop button are within your reach with just a fingertip press. There are numerous features that make this appealing to entry-level and intermediate users. Nonetheless, the speed and the number of built-in stitches makes it evident that expert stand more chance by being owners of EverSewn Hero. Top level embroiderers will already have their eagle eyes on this one. The embroidery design size and the working space makes it an essential embroidery machine in their workshop.